Dolphin Discovery has earned a stellar reputation as the world’s premier facility for swimming with dolphins, and the Isla Mujeres location is one of the finest of their six locations. The dolphinarium includes a huge 10,000-square-meter ocean area, surrounded by a perimeter of gorgeous white sand beaches and swaying palm trees. 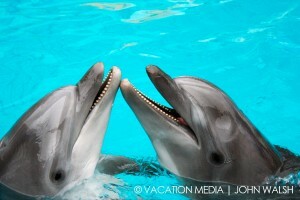 If you’ve ever dreamed of swimming with dolphins, Dolphin Discovery provides the ultimate opportunity. The clear, mild waters of the Caribbean provide a perfect habitat for humans and dolphins to convene. Aquatic explorers of all ages and swimming skill levels can choose a suitable program to interact with the dolphins in a safe, comfortable environment. Each time you swim with dolphins, you’ll enjoy a completely unique experience – no two sessions will be exactly the same. You might enjoy a simple encounter by listening to them “sing,” get formally introduced by shaking hands, be greeted by a hug or a kiss, or – for the more adventurous – take a ride on the dolphin with a “belly ride” or a “dorsal tow.” During the “Dolphin Nursing Swim,” participants can swim with a baby dolphin and its mother. Some programs even offer interactions with sea lions and manatees. For the true thrill-seeker, the Dolphin Discovery Park allows visitors to swim with stingrays and sharks. If you prefer to remain on the sidelines as a spectator, you can relax on the beach with a drink and watch while the dolphins interact with their handlers and perform amazing tricks. If you’re staying on Isla Mujeres, you can reach “Discovery Island” easily by taxi. At most, it’s a 15-minute trip from anywhere on the island. If you’re coming from Cancun, you can catch a ferry to Isla Mujeres and then hire a cab to reach the park. Don’t initiate physical contact with the dolphins, as this can impact their behavior. If they’re in the mood to be touched, they’ll come to you. Don’t try to swim after them. It’s physically impossible for you to catch up, and you’ll only cause them to swim far away from you. Don’t feed dolphins. By consuming food that humans have tossed into the water, they’ll be less likely to rely on their own scavenging abilities.